Photo courtesy of Paul Gordon Pictures. We have the information you need to discover the best recreation opportunities on public lands in Washington State. We also have a wide selection of educational merchandise and free printed materials to help you make the most of your visit. We're able to bring you this unique service experience through a dynamic partnership with the National Park Service, US Forest Service, Washington State Parks, and REI. Many recreation passes you'll need for areas in Washington and Oregon are available at the Ranger Station inside the Seattle REI Flagship Store and are available in our Discover Your Northwest online store. Some passes may be available at the area you will be visiting or through other organizations, check with one of the Rangers to find out more. Questions? 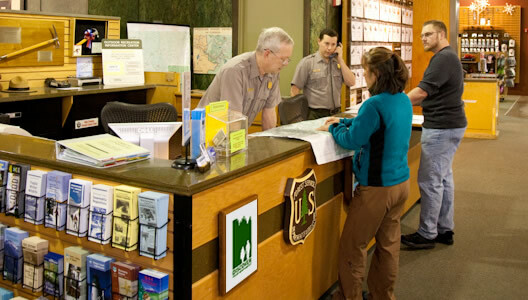 Please call us at 800-270-7504 or 206-470-4060 or better yet – visit the Ranger Station in person at REI in Seattle. You'll be glad you did. Happy trails! Entrance and recreational use for Federal Recreational Lands (NPS, USFS, BLM, USFWS, BOR). Entrance and recreational use for Federal Recreational Lands plus 50% discount for some camping. Entrance and recreational use for Federal Recreational Lands. Recreational use at USFS operated sites in Oregon and Washington where a day use fee is required. Self-validate for the date of use. Valid until midnight of date on pass. Recreational use at USFS operated sites in Oregon and Washington where a day use fee is required. Self issuing, printable pass validated for the date of use. Recreational use at USFS operated sites in Oregon and Washington where a day use fee is required. One-day vehicle access to Washington State Parks non-motorized sports Sno-Parks. Seasonal vehicle access to Washington State Parks non-motorized sports Sno-Parks. Special-Groomed Trails permit with the Non-Motorized Sno-Park Seasonal Permit. Required at designated groomed trails Sno-Parks including Cabin Creek, Chiwawa, Crystal Springs, Hyak, Lake Easton, Lake Wenatchee, Mount Spokane, and Nason Ridge.